The death of blogging. The death of SEO. The death of Facebook organic reach. And now, the death of Instagram for brands. First, let’s be incredibly clear: Any article title that declares the death of something (unless it’s the death of a someone), can’t be taken seriously. It’s an exaggeration. It’s click bait. And it’s intended to generate panic and discussion. Declaring the “death of brands on Instagram” is quite possibly the easiest title ever written. You know that brands are worked up into a frenzy over organic reach on Facebook. You know that no matter how inaccurate the statement, many will be lined up in support of it. While the statement is surely misleading, it also misses a very important point. A point that brands too easily miss because of their tunnel vision concern for themselves at this very moment. By declaring the death of brands on Instagram, it shows a prioritization for the well-being of the brand while caring little for the user. Because, dammit, who cares about user experience? Who cares if engagement is dropping due to bad brand content? Who cares, as long as my brand gets seen as much as I think it deserves to be seen? The customer is always right? We’re a lying bunch. We, as a group, don’t care about the customer. We don’t care about the user experience. We don’t care about our place within a social network. We care about making money right now. Or that is at least implied by the steady flow of “death of…” article titles. In reality, these reactions reflect the actual problem we’re seeing right now: The death of brands that care about people. The death of brands on Instagram? How about the death of brands that care about people? That’s the abbreviated version, of course. But the more complicated version is that Instagram wants to use an algorithm to get an idea of what you are most likely to engage with and show that first. Keep in mind, this early algorithm is not the same as what orders our Facebook posts every day. At least for now, all of the posts that could be in your Instagram feed will still be there (as opposed to filtering out the best or the worst), they’ll just be in a different order. While it’s probably a good assumption that Instagram’s algorithm will eventually more closely mirror Facebook’s, I think it’s important to keep an open mind here. Instagram is going to test this slowly to see how users respond, and how the algorithm is rolled out will depend upon that response. Of course, that doesn’t mean it will depend upon whether users freak out and protest. Facebook users have freaked out and protested for a decade. That doesn’t matter. Instead, they’ll watch Instagram users closely to see how their engagement levels and time using the social network change. That, ultimately, will determine next steps. There was a time when Facebook was a utopia for brands. High reach and engagement with very little competition. That eventually changed, and many point to the algorithm. The algorithm, however, is only a small part of the story. Instagram is a great real-time example. While brands are currently reacting to the threat of an algorithm, what they should be doing is reacting to the steep drop in engagement with brands on Instagram — without an algorithm. According to a study by Quintly, engagement rate with brand content on Instagram has dropped 37.5%, from 4.96% to 3.10% from the beginning to the end of 2015. According to that same study, post frequency from brands increased 27% from January to October of 2015, settling in at a final 17% increase from January to December. Quintly also found that the growth rate of brand followings slowed from 21% at the beginning of 2015 to 16% by the end. Social analytics and reporting company Locowise finds that things aren’t getting any better in 2016 — in fact, they appear to be getting worse. 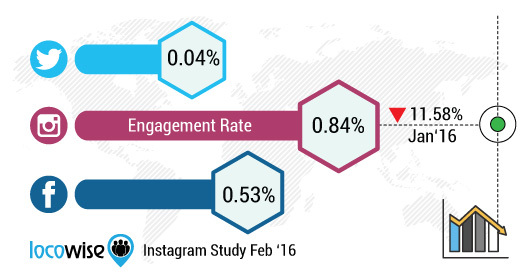 According to the Locowise study, follower growth dropped nearly 46% to .2% from January to February of 2016. This was the lowest rate Locowise has recorded for brand growth on Instagram, falling nearly 93% since their first study in April of 2015. Locowise, who uses a different approach to measuring engagement rate than Quintly, still reflects a consistent drop in the metric. They show a 11.58% in brand engagement rate to .84% from January to February, a 70% drop since last April. There are more brands on Instagram. Those brands are creating more content than they once did. But Locowise also points out that users now follow 400-500 profiles, up from 250 a year ago. Combined with the now 200,000 active advertisers on Instagram, it’s easy to see that competition in the feed is increasing at a furious pace. For comparison, Instagram now has more active monthly users (400 Million vs. 320 Million) and active advertisers (200,000 vs. 130,000) than Twitter. The cynic will say that this is all part of the parent company’s (Facebook’s) plan. Give brands a taste, make it harder for them and then force them to pay. But read those numbers again. This is all without an algorithm. If Instagram does nothing, those numbers will surely continue to drop. A significant drop in engagement is an ominous sign. It represents that users no longer care about something as much as they once did. No matter what the cause — more competition or more lower quality posts from brands — a user clicks less frequently than they did previously. Why? Shouldn’t brands care about this? Instagram certainly does. 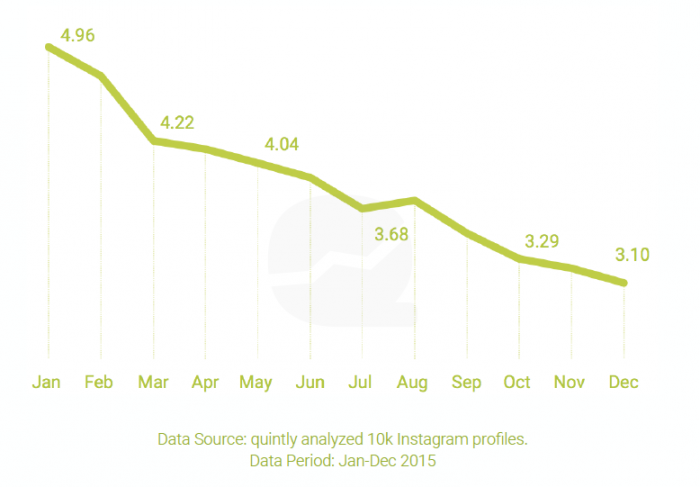 If user interest drops, Instagram needs to pay attention. If the user experience suffers, users may ultimately use the platform less often or abandon it altogether. Whenever I hear brands griping about an algorithm, I can’t help but think they are being shortsighted. Let’s say that no algorithm is created — Instagram wants to make the brands happy. So they keep everything as it is. Engagement continues to drop. Reach — because of increasing competition — continues to drop. User experience continues to drop. 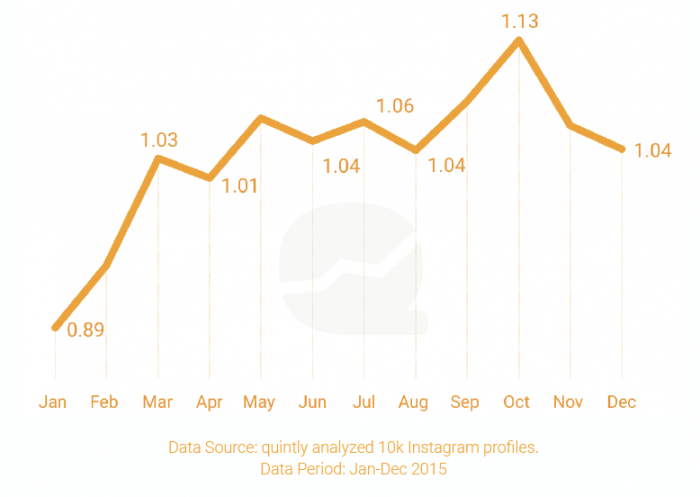 Eventually, users spend less time on Instagram, and growth slows. This is horrible for brands. Now your posts reach a small percentage of followers due not only to competition, but because fewer of them are on Instagram every day. Now when you do advertise, you have fewer engaged users to reach, and there is less targeting power based on user actions. With an algorithm — if done right — users will see more of the content they want to see. Engagement rates will stabilize, if not go up. The user base will continue to grow, giving you more people to reach organically and paid, with more targeting power based on their high levels of interaction. That doesn’t mean an Instagram algorithm will surely be a success or that it will have a positive impact on engagement. But there is precedent. Panic about any talk of an algorithm has its source with Facebook. Brands feel wronged because their reach has dropped over the years, pointing to the algorithm as the cause. First, it’s impossible to say how much the algorithm has contributed to the average brand’s post reach dropping from about 16% to 5-10% in the past two to three years. Facebook has also grown to more than 1.5 Billion monthly users (more than 1 Billion every day), with more than 3 Million active advertisers. But here’s the inconvenient truth that brands, who swear that users are being wronged by not seeing more marketing content, fail to acknowledge: Engagement rate on Facebook is at an all-time high. In the fourth quarter of 2011, there were 483 Million daily active users on Facebook, a number that was 57% of the monthly active users total. Not only have the daily and monthly active users grown, but the ratio of the two has also continued to grow through the end of 2015. As of the fourth quarter of 2015, there are now more than 1 Billion daily active users (more than double the number from four years prior). 1. The number of people who use Facebook every day continues to grow. 2. 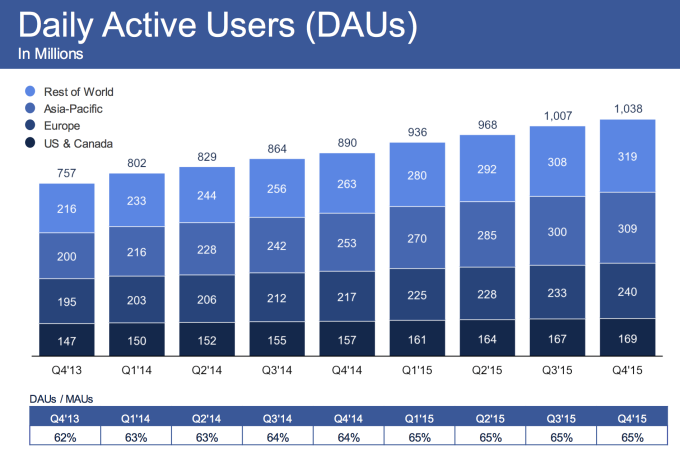 The share of monthly users who use Facebook every day continues to grow. 3. 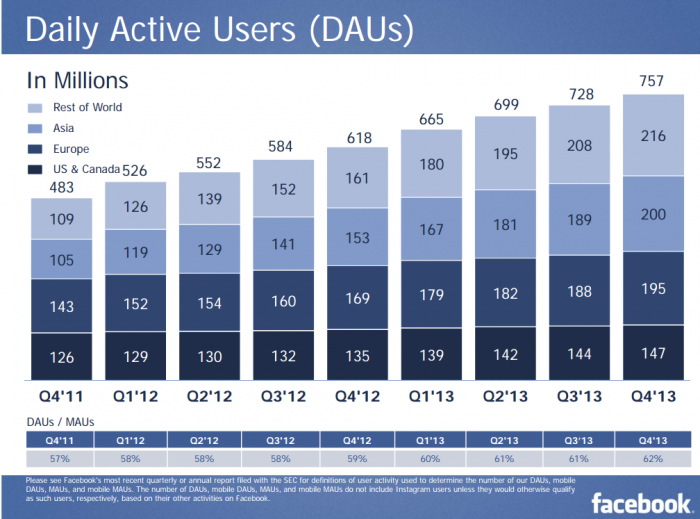 There are not only more active users now than ever before, but a larger percentage of users are on Facebook every day. Are you following? On other platforms — take your pick between Myspace, Twitter, Google+ or Instagram — engagement tends to plateau. Interest wanes. Growth slows. But on Facebook, all of these things continue to increase, despite Facebook becoming “less cool” and more like a utility. We have to stop short of saying this is entirely due to the algorithm. But if the algorithm was a bad thing — if it negatively impacted the user experience — don’t you think we’d see this reflected in these numbers? And if your response is, “But, Jon… Facebook isn’t making it more difficult for users to see content from friends with the algorithm, this mostly impacts brands,” you prove my point. Yes, of course users prefer to see content from friends over content from brands (though not in all cases — and the algorithm doesn’t always negatively impact brands). That’s why the algorithm is needed in the first place. Without it, Facebook would be flooded by brand content. Without it, Facebook would be a far less interesting place. The algorithm controls the balance of brand vs. user content (or more importantly, the balance of good vs. bad content) to assure a positive user experience. This is silly talk. Not everyone is on that social network every day. Even those who are on that day may not be on when you post. And no, a follow does not imply that they want to see all of your content. If you want to see what an unfiltered firehose does to brand exposure, look no further than Twitter. We don’t know what exactly the reach is there, but you can bet it’s below 1%. And I refer you to the prior graphic from Locowise that reports a .04% engagement rate on Twitter — about 1/13 of the rate on Facebook and 1/21 of the (falling) rate on Instagram. 2. Without an algorithm, more people will see your stuff. You assume this. You assume that with an algorithm, less of everything is seen. But it’s not true. Facebook favors the good stuff over the bad stuff. So if you create content that users have indicated they love, you may actually reach more people and get more engagement than you would without an algorithm. Why? Let’s go back to the understanding that not everyone is online when you post your content. Without an algorithm, you only reach those who were either online then or who saw it because someone they followed shared it. With an algorithm, you may still see content if you weren’t online — even if someone you follow didn’t share it. This happens because Facebook (or Instagram) drives it to the top if they think you will like it. 3. Reach is directly correlated with engagement. Sure, if no one sees your content then no one will engage with it. But that’s not what typically happens with an algorithm, and it certainly isn’t its purpose. The purpose of an algorithm is to show the right content to the right people. Let’s consider two scenarios: 1. Your content is shown to 100,000 people; 2. your content is shown to 10,000 people. If you’re smart, you don’t know the answer. What if in the first case, your content received engagement from 100 people while in the second, your content received engagement from 500? The type of engagement matters, of course, but you get the point. The purpose of an algorithm is to stop wasteful impressions and show content to people who actually want to see it (and before you say it, lurking can be measured). Case in point: Locowise reported that Facebook brand post reach increased by 39.51% in January from December of 2015. The 10.86% reach rate was the highest since Locowise began measuring it. Meanwhile, engagement rate was down 11.18% from December to January. In other words? Reach does not always correlate with engagement. The increased reach was apparently due to a tweak in the algorithm, but one that did not result in an increase in engagement. The problem, of course, is that too many brands would see that increase in reach as progress instead of focusing on the numbers that actually matter. Okay, allow me to involve myself in the “death of…” discussions. Sure, Twitter isn’t dying (yet). But Twitter is certainly on a noticeable decline, and as a company Twitter appears to be getting desperate. You saw the horrible engagement rate earlier, and as mentioned, Instagram (a much younger platform) already has a larger monthly engaged user base as well as far more advertisers. So… what is Twitter’s response? How are they trying to stay afloat? They created an algorithm. Sure, this may help revenue, but not for the reasons the cynics think. It’s not that “Twitter is forcing brands to pay to reach their audience.” We already see that reaching your audience on Twitter is extremely difficult. Instead, creating an algorithm is more of a long-term (if far too late) approach. It considers the user experience while also going after revenue. As Facebook can attest, it’s nice when user experience and revenue coincide. Understand that the fact that Instagram is creating an algorithm isn’t automatically a good thing. Instagram isn’t Facebook, and we don’t know how this is going to work. It’s certainly encouraging that Instagram is taking a very cautious approach with its slow roll-out. The first is obvious: The algorithm may not work. It may not actually surface the content people want to see, and it may prevent people from seeing what they truly wanted to see. We can’t expect the algorithm to be perfect. Facebook’s certainly is not, which is why it is constantly tweaked. But the goal should be to learn from the results and make changes as necessary so that engagement rate remains steady — or in Facebook’s case, grows. The second is that an algorithm encourages its user base — and mostly brands — to game the system. On Facebook, brands have constantly chased the perceived preferences of the algorithm to post in ways to reach the most people, rather than simply posting the best content. First, brands posted everything as a text update when such updates got the most reach. Then they switched to images. Now links. Meanwhile, users don’t care about the algorithm, and share in whatever way makes the most sense. One of the primary dangers of an algorithm is that it can encourage people (again, almost always brands) to share unnaturally in an attempt to game the system. Between the three primary social networks (Facebook, Instagram and Twitter), an algorithm may actually make the most sense for Instagram. It’s an obstacle for Facebook wanting to be a place for real-time sharing. And it could ultimately ruin what makes Twitter special for the same reason. But with Instagram, it matters quite a bit less whether something was shared right now or 12 hours ago. Sure, some content is more valuable there when it’s real-time. But in most cases, seeing content in order of “best first” while pushing down the less engaging stuff may actually be a good fit for Instagram. Who knows? 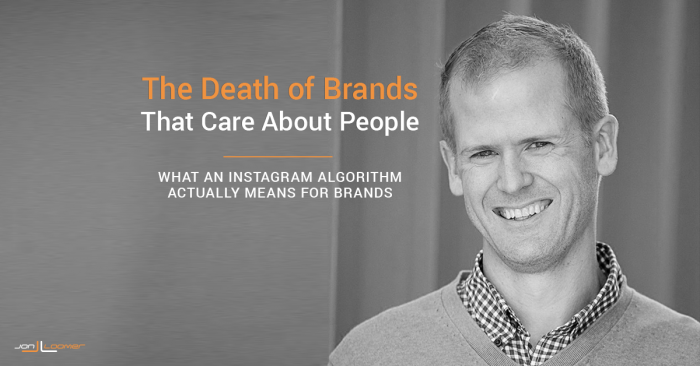 It’s impossible to say now whether an algorithm will be good or bad for brands on Instagram. But before we freak out about it, it’s important to think through why it may be necessary, how it may help and what the alternative may be. What do you think about an Instagram algorithm? Let me know in the comments below!